As the weather gets colder, many farmers are faced with needing more shelter space for their livestock. The most important need is for the new calves who require extra protection from the harsh winter air. Sheltering new calves from winter weather can give them a little head start in life! We are firm believers that keeping calves out of the severe cold and snow for a few days goes a long way towards raising fat and healthy calves. At USA Containers we are always looking for new and innovative ways to adapt our storage containers to meet the needs of businesses here in the Midwest. Being in the heart of farm and livestock country – and being farmers ourselves – the agricultural community is naturally near and dear to our hearts. We own a row crop and cow/calf operation here in Illinois and know the difficulties of running a profitable business. Recently, we found ourselves in a difficult position. Our existing barn space was simply too small for the size and number of our livestock. We needed a quick and economical solution to add a few more cow/calf pens to our operation. In this, the CALFtainer was born. 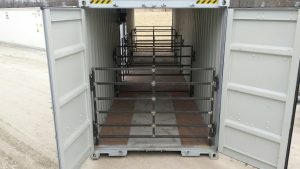 We outfitted one of our containers to work as addition pens for the cows and calves, adding brackets, gates and an extra set of double doors on the side. We found the container to be the perfect size for our needs. The cows and calves fit comfortably within and the container fit in the available space we had. The best part? It was much cheaper than building a whole new barn. Our containers are also commonly used on farms as secure storage for supplies such as seed and heavy equipment. Interested in what USA-Containers can do for your operation? Contact Us!